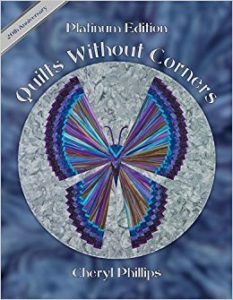 Using the book “Quilts without Corners”, you’ll pick the pattern of your choice to create a stunning work of art in the round. Very unique style, but with Diane’s expert tips, you’ll be “rounding” up a new quilt before you know it. The Platinum Edition book combines the best of the original book with the best of the Quilts Without Corners Encore with updated samples, size conversions, creative options and additional designs.